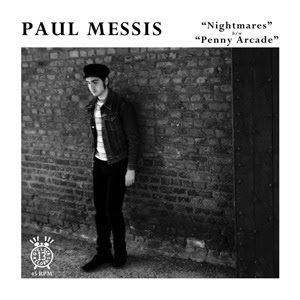 You wake up one morning and - hallelujah there's a new single from Paul Messis on 13 O'Clock Records out of Austin. I had no idea Paul has been working on another single of completely new material, "Nightmares" and "Penny Arcade" sounding even more polished and contemporary then Case Closed. Still heavy on vocal harmony and his pitch perfect recreation of late '60s psych rock sounds down to the particular reverb on this tight snare. Every time I'm in the mood for this contemporary psych rock, I put on anything from Paul and I'm surprised at how perfect he can do it. A-Side's "Nightmares" is another fantastic track in the impossible to sort list. I shouldn't even question it, it's happened so many times now. His records have stayed close to the turntable for months now, they've gotten me to revisit The Kinks, The Zombies and 13th Floor Elevators for clues as to how we got here. Heavy, warm distorted reverb strums open into his complex electric finger style and vocal harmonies. The drum sound is perfect as usual, like playing in a tiny cave down the street sound. You haven't heard snare rolls like this since Flowers it's that careful an ear. The whole package is perfection. I don't remember Paul sounding so young previously, I wouldn't have blindly categorized this for a later release, it sounds like he did away with most of the effect on the vocal and played it straight with a slight reverb and taking control of this position. The sign of of a more confident songwriter and it's about time. Delivered in an ultra-pop garage style with swirly solo's planted for a moment of pause to reconsider the welcome drop back to dense pop. The lyric that could have applied to the late '60s is transposed to today with the same results. Making a nightmare sound this good isn't easy and to be honest almost defeats the point. The curse of his gleaming pop. B-Side's "Penny Arcade" has a warm tremolo electric opening which seems to be something of his trademark; a sort of misdirection so when the track gets going it's always a shockingly massive sound and the harmony is a perfect homage to the era and looking completely forward. On this side he's taken it easy a bit and started to examine those relationships that are just as hard as the world's problems. A harmonica tears open the garage sound and the drums on this one have a thicker, lower end kick because all of these tracks aren't ever overly anchored in the past and consistently reinvent that classic sound. He's able to craft that perfect under three minute psych pop track with loose laid back sincerity that's infinitely listenable. It comes natural is what I'm saying. As complex and mysteriously dense it's still down to earth - but I'm over thinking this in a way that Paul wouldn't be OK with. 'What is this guy going on about?". You have to take time and let both sides sink in the way a good single should do.